Boy have I been busy this past week. Last weekend was full of baking and shipping cookies. Baking for what? 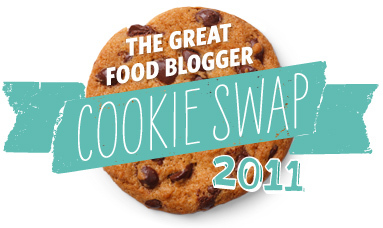 Well, the first annual food blogger cookie swap, thats what! 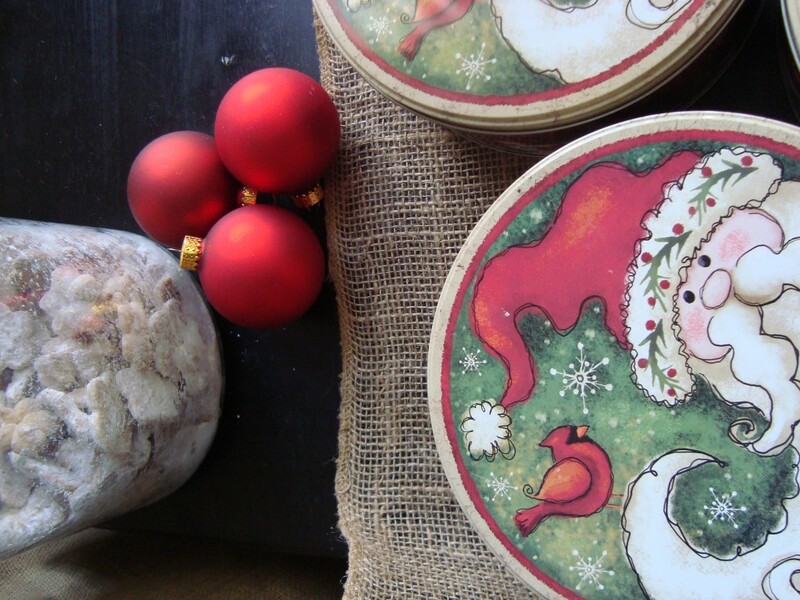 Yes, we did a cookie swap with a BUNCH, like a BUNCH, of food bloggers. It all started innocently by Lindsay from Love & Olive Oil. It’s all her fault, and Julie from The Little Kitchen, you can blame her too. It began one weekday and with a tweet. There I was scrolling through all these tweets, when Lindsay popped out “We should totally do a food blogger cookie swap”. I jumped on it, “ME!”, I wanna join. I went in head first, not knowing how deep the pool was. BEST. DECISION. EVER. I really had no idea that this tweet would actually lead to a swap. I thought, how can they put it together? Well, they did, and BIG. Those girls are geniuses! A few weeks after that tweet came a sign-up email. It was ON. Then the “oh oh” thought came to me… what cookies will I make?? Christmas came to mind, and these babies mean Christmas to me. These darlings have been around since I was 12. Back then, I had no name for them. They were just Christmas cookies, my mother would only bake during the holidays. 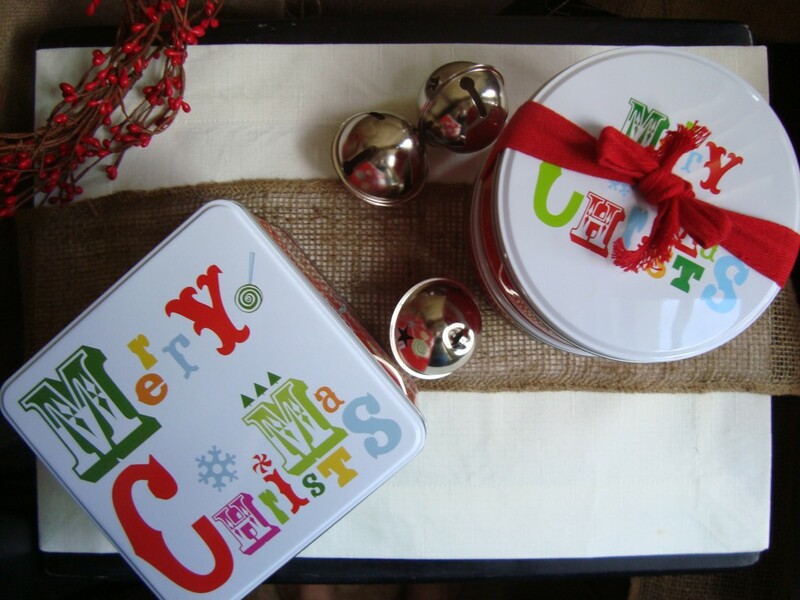 She would give them to neighbors, family, and friends, in tins full of cookies. We would help her make them every year. She’d make the dough, we’d pop them out the cookie press. And taste a few, a couple from each batch. I love these cookies, because of the memories. There are fancy ingredients, really none. Just butter (LOTS), sugar, flour, eggs, and vanilla. Nothing special. Just a lot of love. That cookie press is no joke. I don’t know where my mother got her recipe from. It’s just one of many recipes she written down through out the years in her recipe book. But this is one that I know by memory. So this was it, the butter cookie as I now call them. Now, where does crack come in?? 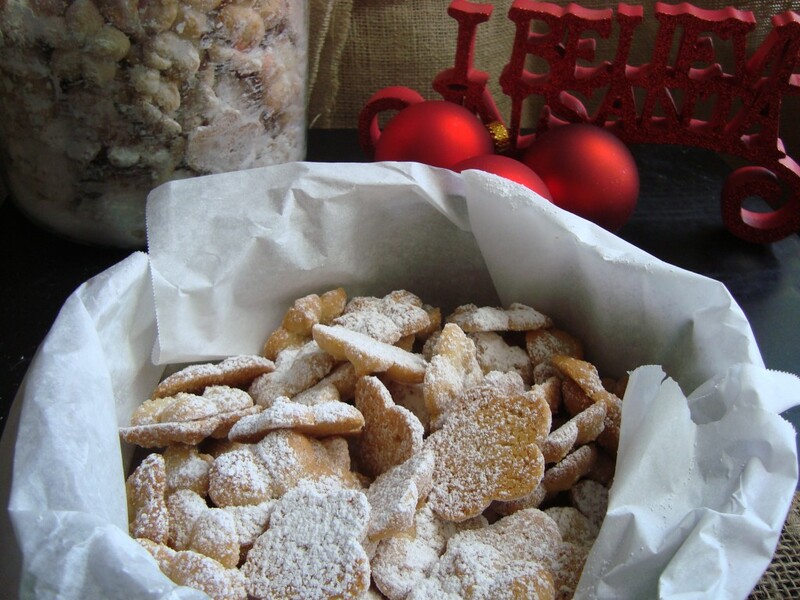 Well, the first Christmas (years ago) that I made these cookies for my coworkers (now, great friends) they dubbed them “crack” cookies. Simply because they couldn’t just eat one. 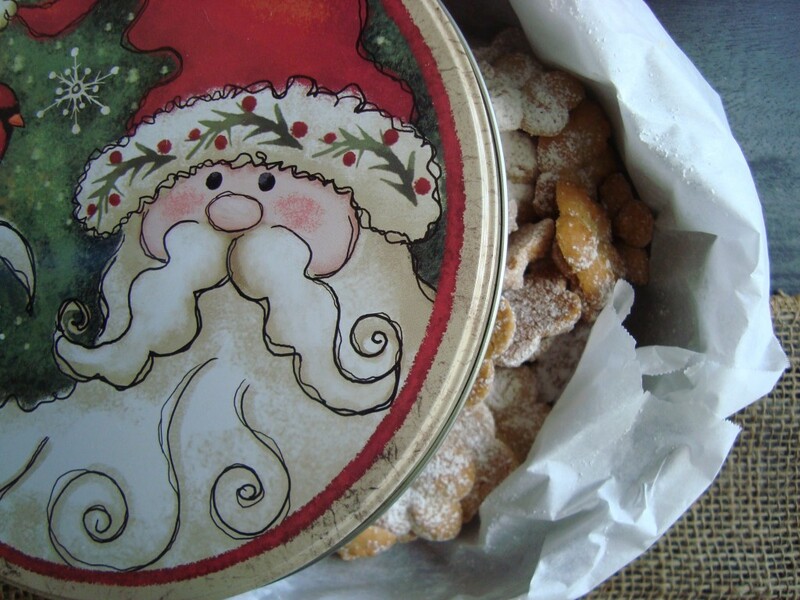 I had given each of them a tin of cookies, and before they knew it they had gone through half the tin. Leaving the evidence of powdered sugar all over their desk, clothes, and hands. They are addicting, you cannot just have one. I dare you, double dog dare you. So I made my darlings, and shipped them away to my 3 recipients. May I just add how my heart hurt a little after I left the post office. Really, I was sad. I had labored away on these suckers and off the went. It was my first time~ EVER~ sending baked goodies away. I wonder if this is how it will feel next year? I watched those babies like a hawk. Checking, waiting for delivery confirmation. Then I got MY cookies!! My first batch of dozen cookies. I was now the recipient. Man, what a great way to cut the day in half at work. Up at the front desk, COOKIES! They were from Pam at Apples to Zucchini. Butternut Squash Snicker-doodles! Yes, butternut squash. The most moist cookie ever. You can’t taste the squash, they are so good. I will definitely be making these. A day later came my second batch. 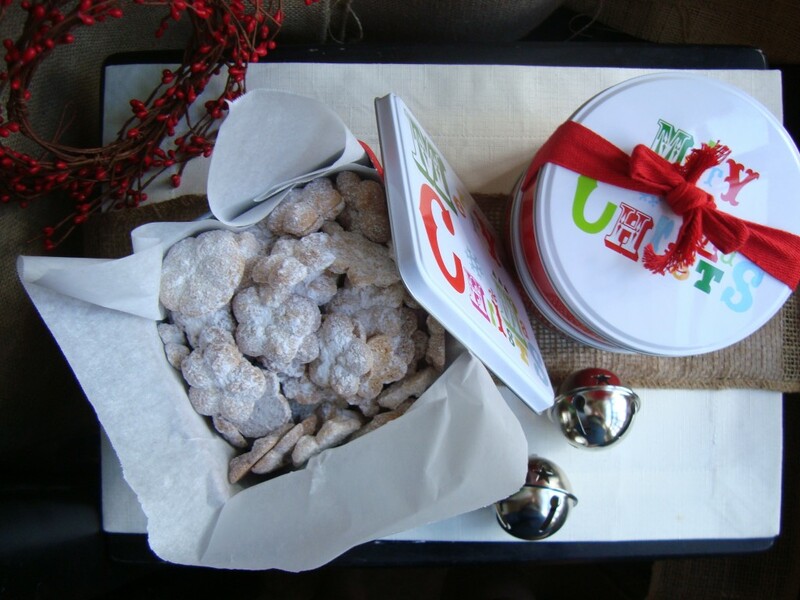 From Cassie at Bake Your Day, French Cookies. I went across the pond, yo! They are little waffle cookies So yummy and crunchy. 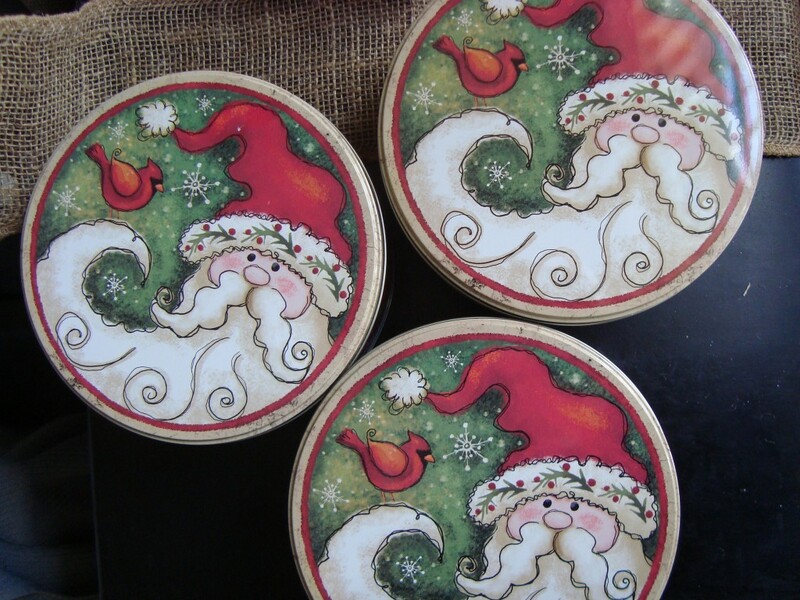 Loved them, great for dipping in hot chocolate. I eagerly awaited each batch. Then my third and final batch showed up at my desk. They took me over to Italy! Polenta Cookies with Grappa & Dried Fruit, from Paula at Bell’alimento. Seriously, delicious. I made out with 3 GREAT dozen cookies, each different from one another, and each just as delicious as the other. I can’t wait to make them. The Great Food Blogger Cookie Swap, was seriously the best idea ever. It brought us all together, made all our hearts smile, and made the holidays even more special this year. For we all connected, in more ways than one. Using your mixer and the paddle attachment, mix the butter & sugar until creamy in texture. Add the eggs and vanilla, mix until combined. Place the flour and cinnamon in a bowl, mix. Now a large spoonful at a time, add to the butter mixture. Mix in between flour addition, mix until combined. You should be able to shape the dough into a ball in your hands without it being too sticky. It will be buttery. 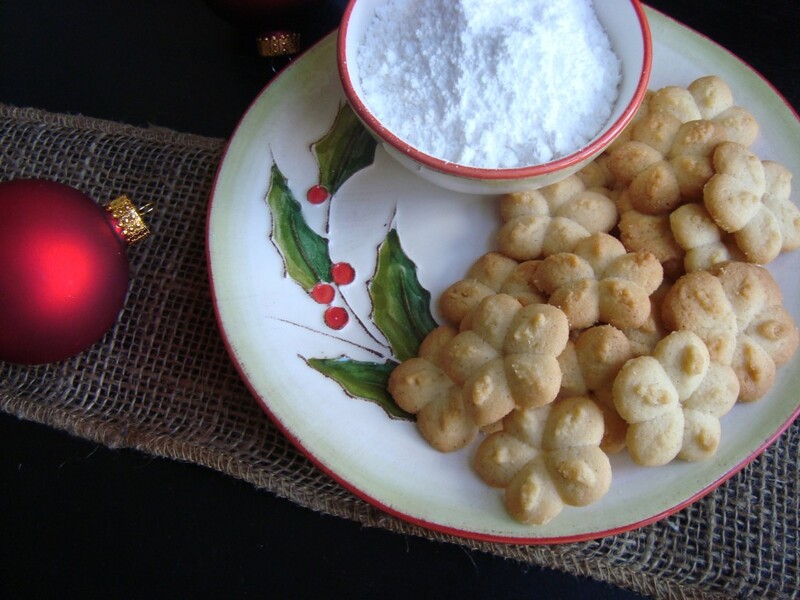 Now, scoop your dough into a cookie press using a star shaped press. Press the cookies unto an unbuttered cookie sheet. Bake until lightly golden, about 15 minutes. Baking time will vary by oven. Watch them as they cook rather quickly. Remove from the oven and let them cool a minute before removing them from the cookie sheets. You can continue cooling them on parchment paper over your counter. 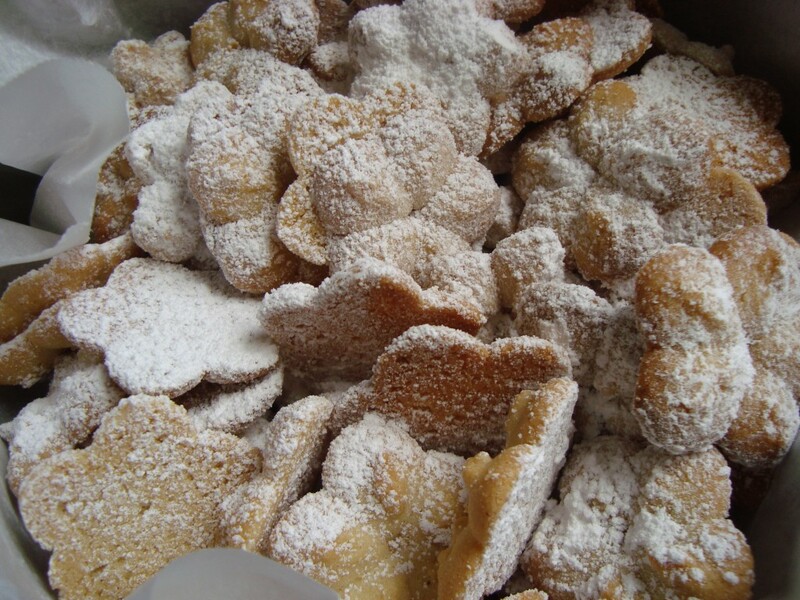 When done, place them in your container and dust all over with powdered sugar. They keep for a week in an air tight container. Hi Confessions of a Recipe Junkie readers. I’m Christina from Mis-Cakes Oven Adventures. I am so excited to be sharing a post with you today. Michelle put out a call for a guest post and I immediately jumped. I got these Jet Puff Marshmallows Bits from my mom when she was in Phoenix. (she got them at Target) They are exactly like the marshmallows from Lucky Charms cereal. Can we say fabulous. I have yet to see them in Canada though. I wanted something fabulous and different. Then it hit me and I knew what I had to do. I immediately got in the kitchen and got baking some cookies. I added fresh strawberries to the mix. 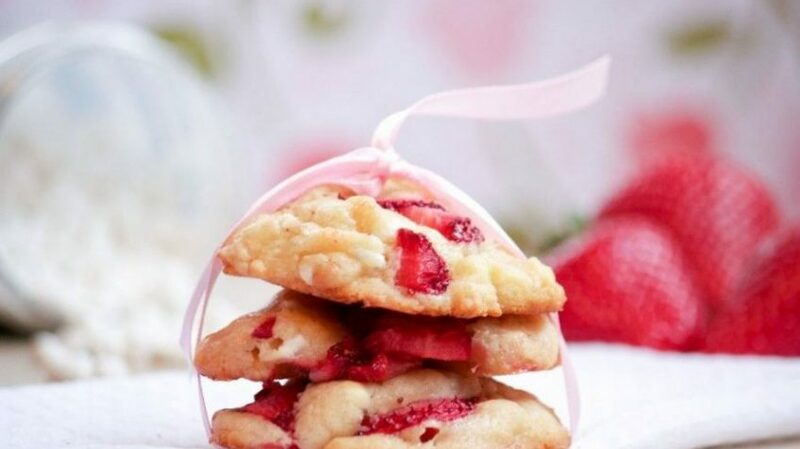 You can never go wrong with strawberries or cookies. I have to confess….I’m a bit of a cookieholic. If I were stuck on a desert island and could choose 3 items, one would be these or maybe these. So here are my Strawberry Marshmallow Cookies. These were sweet and chewy. The strawberry is like a burst of spring. The addition of the mini marshmallows almost makes these cookies taste like strawberry ice cream. I’m in love. The original recipe is doubled from what is below but these cookies are best in the first 3 days, so I wrote it like I made it. 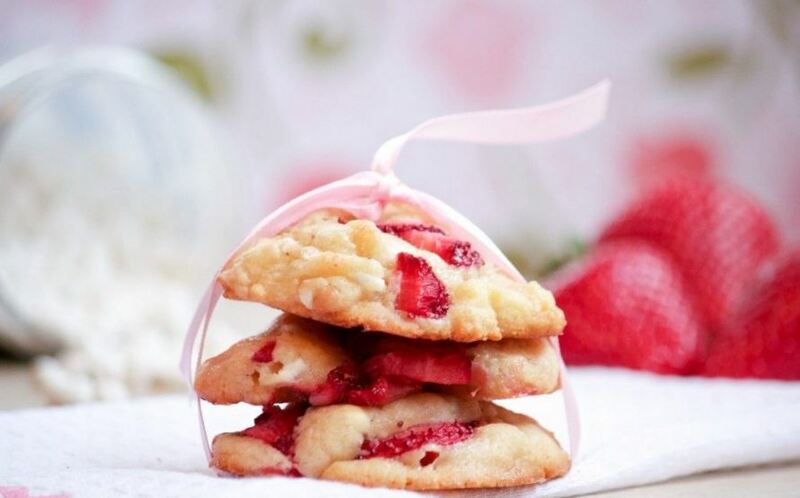 Strawberry Marshmallow Cookies – about 24 cookies. *for the strawberries, I sliced them, sprinkled them with sugar and let them sit in the fridge overnight. You will need to dry them on a paper towel before adding to the batter. Preheat oven to 350 F. Move the oven rack to the middle position in the oven. Line a baking sheet with parchment paper. 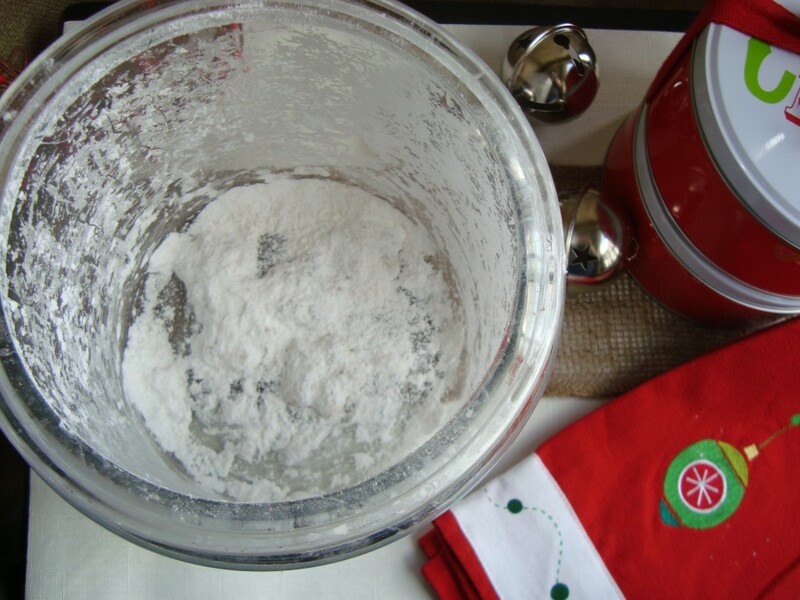 In a medium bowl whisk together your flour and baking powder. Set aside. In a large bowl using an electric mixer cream together butter and sugar for 3-4 minutes, until light and fluffy. Scrape down the bowl and add your vanilla and egg. Mix until combined. While mixing on slow, slowly add in your dry ingredients and mix until completely combined, making sure to scrape down the bowl. Fold in your marshmallows and then finally your strawberries. If they strawberries don’t seem to really stick in your batter it’s all ok. It’s just the moisture. (When you are scooping out your dough just make sure you get strawberry in each scoop.) Scoop by heaping tablespoon onto your lined cookie sheet. 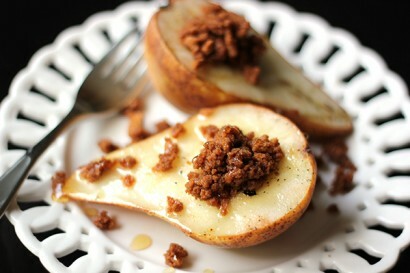 Bake for 10-12 minutes until lightly browned on the bottom.